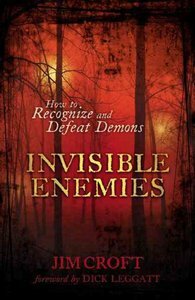 Full of personal testimonies from Croft, his family, and others who have been delivered, Invisible Enemies also exposes and counters some of the more aberrant methodologies that have become the norm. Even better, Croft shows believers how to free themselves and others from demonic powers and how they can maintain that freedom. Jim Croft has been ministering deliverance for 42 years. A friend, mentor, and ministry associate of Derek Prince, he has served on the board of Derek Prince Ministries since its inception in 1975. He is currently the pastor of Gold Coast Christian Church in Boca Raton, Florida, where his primary focus is on training others for ministry. Jim and his wife, Prudence, have been married for 48 years and have four adult daughters. They live in Florida.